You think you're fine with those old tapes. Everybody knows that VHS tapes lose their quality by simply lying peacefully on a shelf. Each time a cassette is played, it's being rubbed by the VCR head. This nasty head is erasing the content of the tapes slowly. If you happened to have lost your tape in an old VCR player, no surprises you hate VHS and would benefit from DVD transfer services. One more thing to think about: all the trends show that in 15-20 years nobody will watch videos using VCR. Actually, few of them will know anything about them. DVD does not lose its quality no matter how many times it's played. Loses quality even if it's not watched for years. 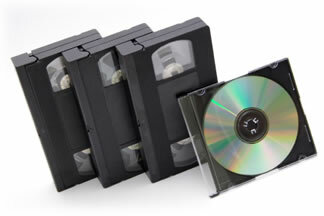 We offer a variety of media conversion and duplication services including VHS conversion services, camcorder tape to DVD, 8mm film to DVD, Hi-8 to DVD, Mini-DV and PowerPoint to DVD. With each trasfer you receive a protective jewelcase and full-color label printed directly to your DVD or CD. We digitize in-house, with respect for your source material. Have a tight deadline, discuss it with us, rush orders are an option! We get your video transfers done right, done fast, and back to you! Call Now To Discuss Your Precious Project! We use Taiyo Yuden DVD+R/CD-R, when we copy VHS to DVD, these disks are the best on the market. Copyright © 2008-2015 AZCopyCats, Your Place for Video Editing, to convert slides, and discounts.